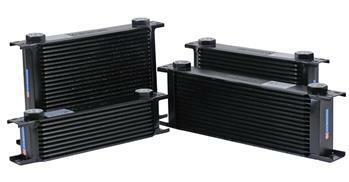 Koyorad universal fit oil coolers are now available! For many years in Japan, Koyorad custom oil coolers have proven their effectiveness during competition in D1 Gran Prix and D1 Street Legal on our sponsored vehicles. These purpose-built drift cars are subject to indirect and inconsistent flow of air, occasional contact between vehicles, and high oil pressures, therefore they require superior build quality and high heat transfer efficiency. The all new Koyorad universal oil coolers are extremely well built, highly efficient and tough. You can expect the same level of precision and attention to detail as with our all aluminum racing radiators ensuring the highest efficiency within the tightest of engine confines. Koyorad Oil Coolers incorporate -10 AN ORB (O-Ring Boss) provisions for the inlet and outlet allowing versatility. Users may easily reduce AN to AN, or convert from AN to Push-Loc style barb fittings for any needs. When you’ve invested so much into you engine, function and quality is paramount. Choose our all-new Koyorad universal oil coolers in combination with a Koyorad Racing Radiator for the best cooling system on the market.